It’s been nearly six years now that my husband has wanted to clear out the old well and try to bring it back to how it once must have been. The old well shaft still looks good but once piped water had been joined to the house no-one seems to have cared about the well. There is still a mark on the stone wall of the house where the machinery must have been attached but that has long since been removed. 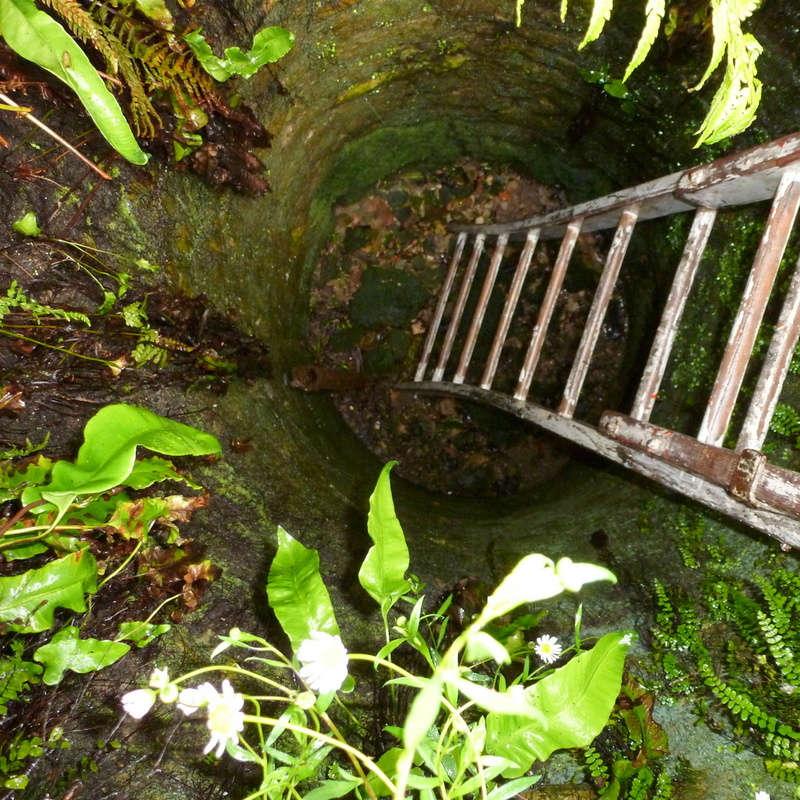 The first problem in restoring the well was obvious. The well had been used to dump unwanted rubble over the ages so it was a simple case of constructing a pulley and removing the offending stones. 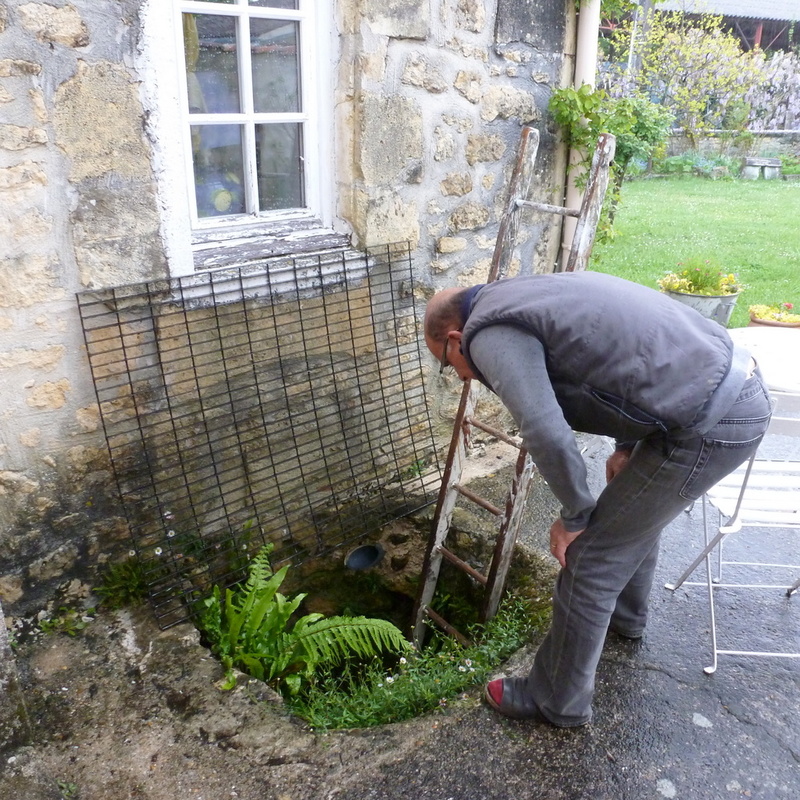 The pulley tackle was bought, but during our first few years here there were always more pressing issues to deal with than clearing the old well. Two years ago my husband finally decided to tackle the well, however, it was not as simple as that. First of all it was autumn and a group of our beloved newts (Triturus marmoratus) appeared to be settling down for the winter. They are such gentle creatures and we often come across them if we turn over a stone or lift up some overgrown plants in the garden. So he felt he could not really turf them out to fend for themselves in the winter. They are not exactly an endangered species but their numbers are being watched as their habitat is under threat, but not in our garden. They do not move quickly and so have to endure being lifted stroked and replaced with care. They take it very stoically and do not seem to mind being held. They have to find their way to water to breed and the male has a raised crest on its back during the aquatic stage. 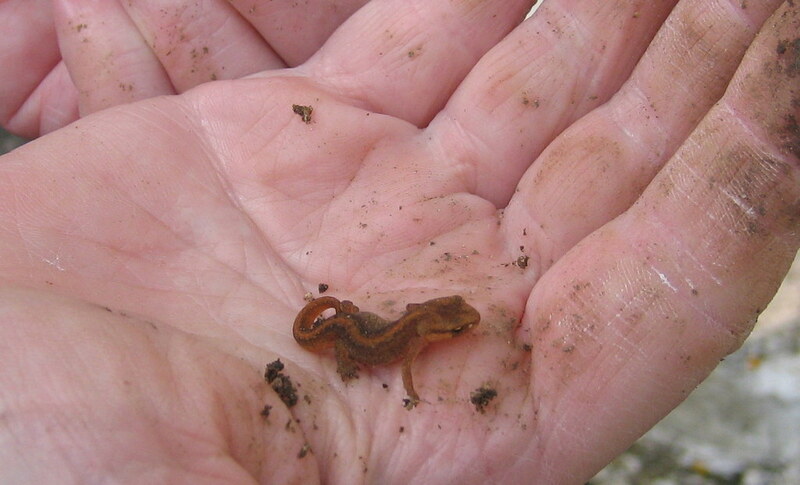 The newts mate during their aquatic stage and the female deposits the eggs in water. I have only seen them around the garden and so I have never seen the raised crest and I cannot tell the males from the females. They all have a red line down the middle of their back and combined with their green and black mottled colouring they are easy to identify. Spring came and they were still there, so we did not like to disturb them during the breeding season…and so it continued. Always hopeful that he might find the well vacant my husband had another explore recently. 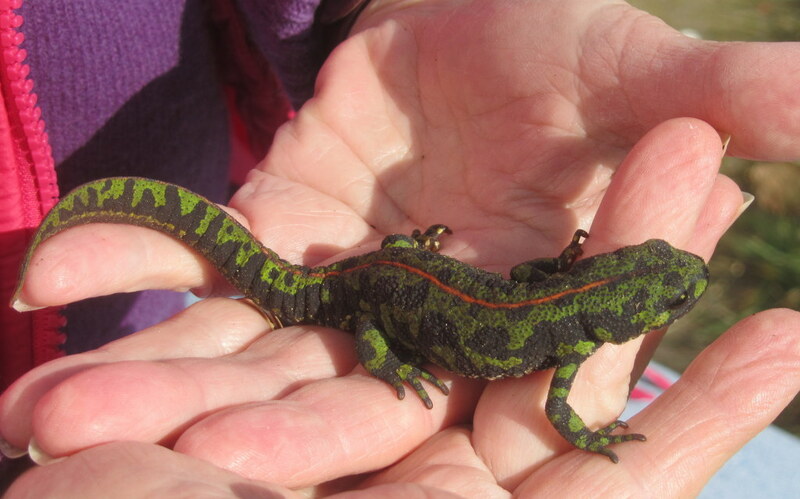 Not only were there the usual newts in a good quantity but they were happily sub-letting to some other amphibians. 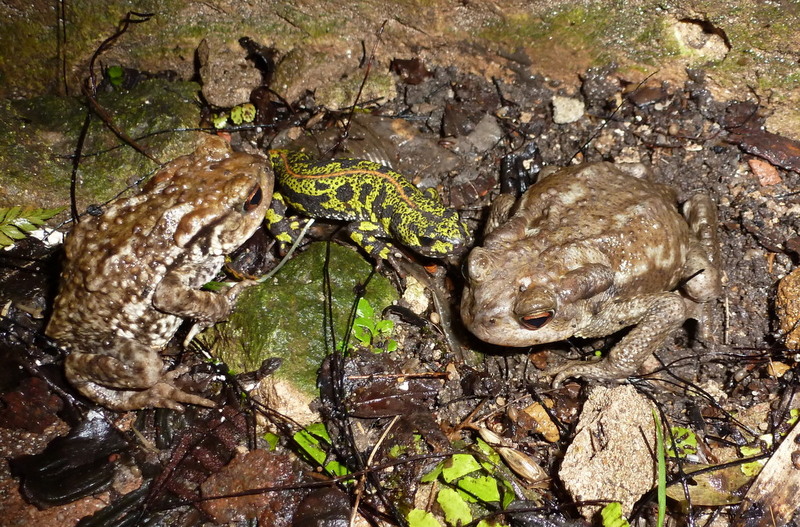 There was a common toad (Bufo bufo) which was obviously enjoying the damp conditions at the bottom of the well. 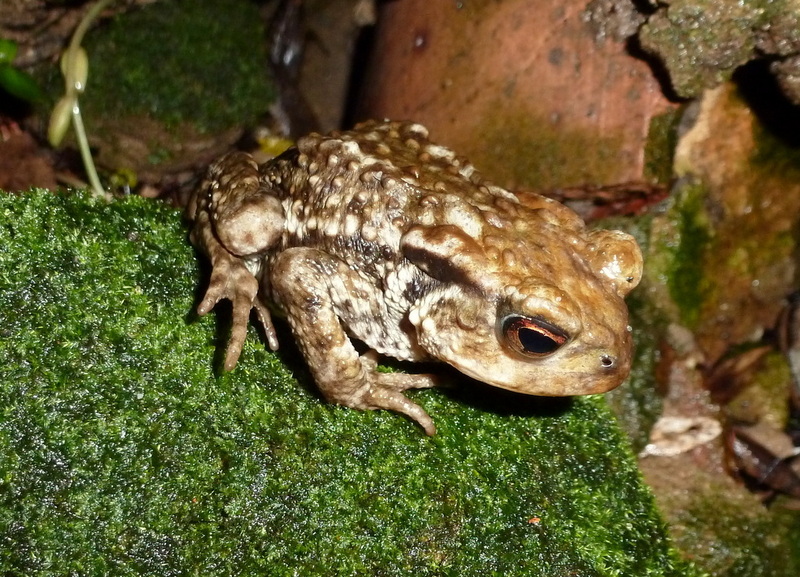 We often come across one in the garden hiding in damp places under flowers. He has lovely golden eyes with horizontal pupils. 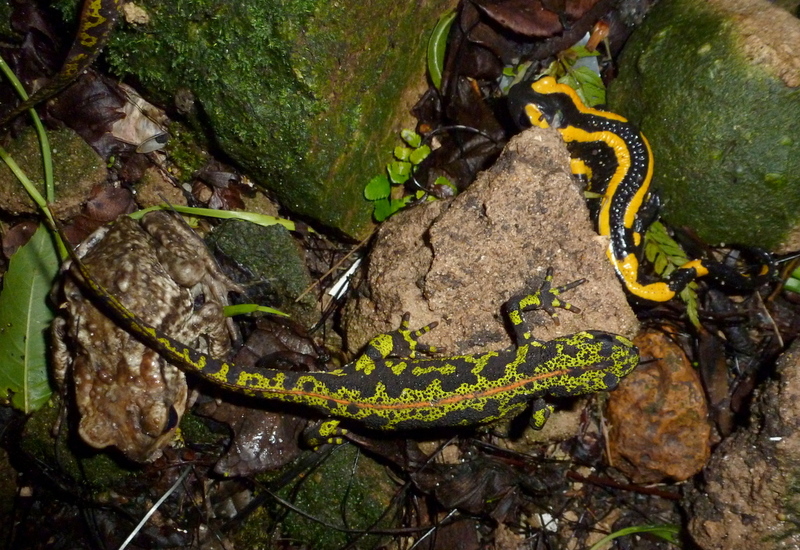 The surprise was to find fire salamanders (Salamandra salamandra) in the well as we had never seen them in the garden. The nearest I had been to them was the flattened ones run over by cars on the road. 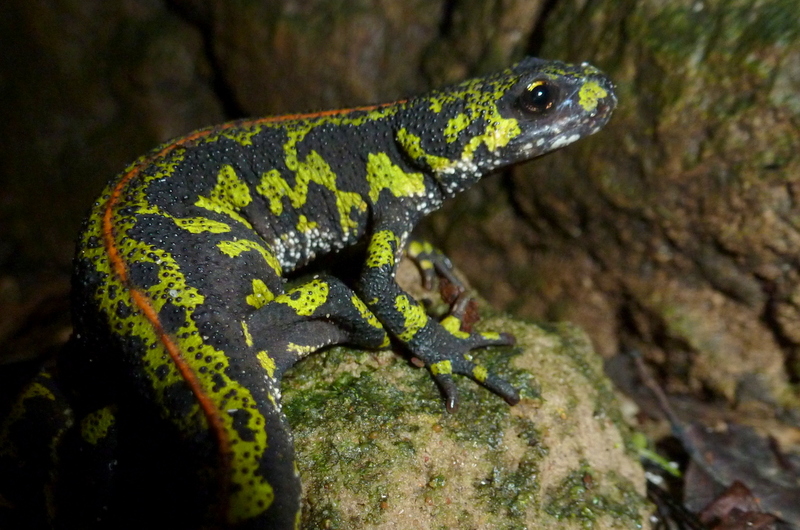 Once again they are easy to identify being bright yellow and black but it is not advisable to touch them as they are capable of exuding a venomous liquid onto their skin. This is certainly a useful deterrent as the venom is capable of killing most of their likely predators and could be an irritant on contact with human skin or if transferred into the eyes accidently. 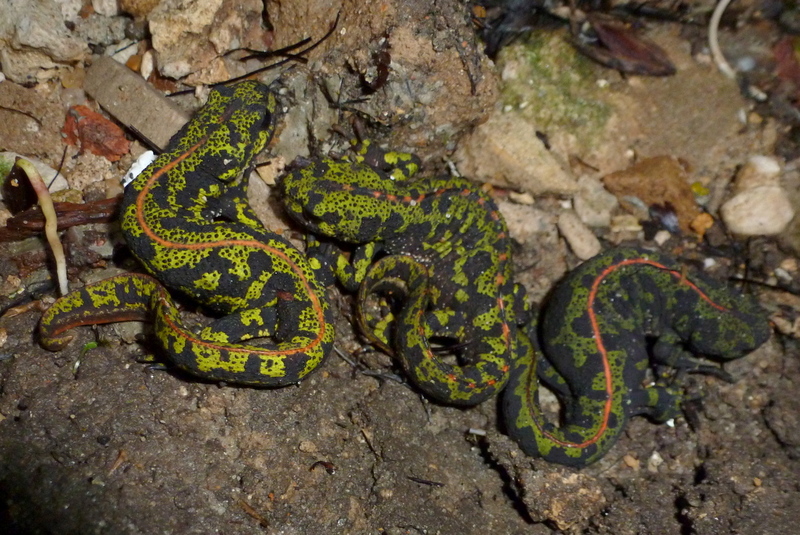 The reproduction of the fire salamander differs from the newts in that they mate on land and the larvae develop internally. The female only requires going to water to give birth to the larvae. This is a snapshot of what we found during one day, what may pass through during the year makes us wonder. The well cleaning project does not look imminent. Perhaps some time we will have a hot, dry summer and they will all clear off giving us time to do a bit of excavating. 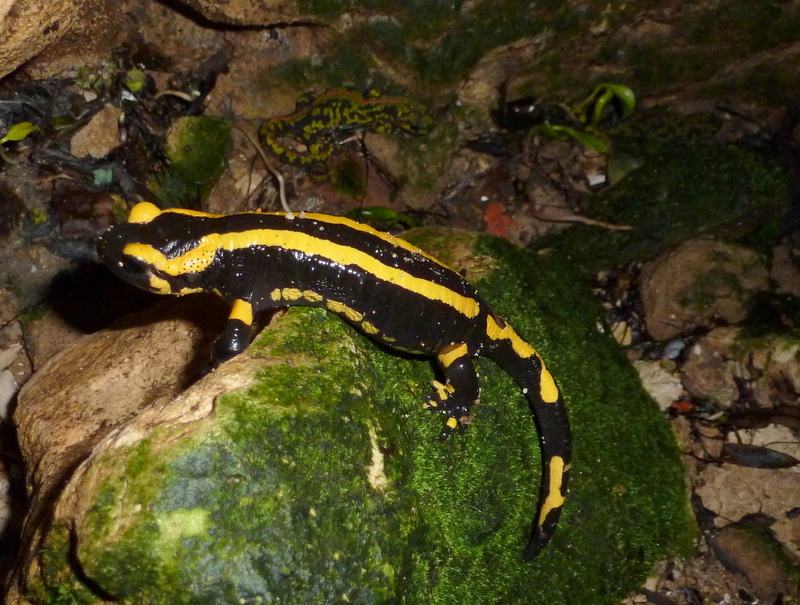 Categories: Garden | Tags: fire salamander, France, garden, gardening, nature, newt, toad, triton marmoratus, wildlife | Permalink.